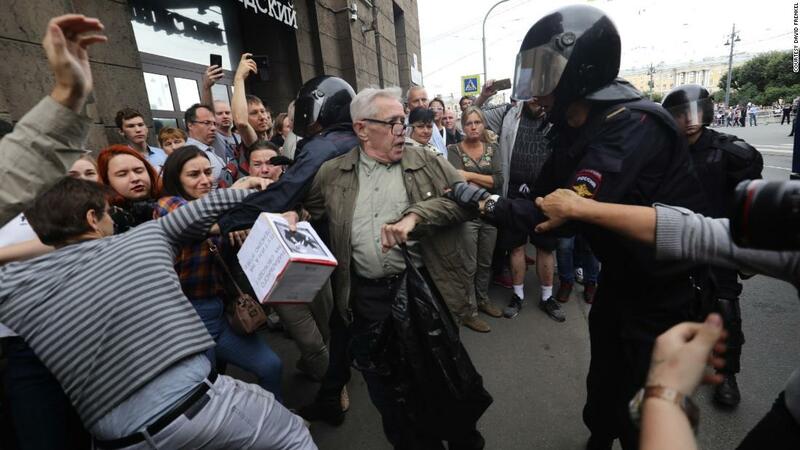 (CNN) Police in Russia detained at least 1,018 people in nationwide protests against a proposed government pension overhaul Sunday, a Russian independent monitoring group said. The crackdown was heaviest in Russia’s second largest city, St. Petersburg, according to independent local media and OVD-Info, a nonprofit organization that monitors detentions. The group said at least 452 people were detained in the city. Protests organized by Navalny have become a vehicle for expressing discontent with Russian President Vladimir Putin and government corruption. Putin’s ratings remain consistently high but have been dented by the pension controversy.